The ketogenic diet sounds simple: Eat fewer carbohydrates and more fat. How hard can that be? Actually, pretty challenging, especially if you want to do it in a way that promotes energy, vitality and health — and gets results. "With respect to the general population pursuing this diet, probably only 20 to 30 percent are really dialed in and following all the rules appropriately," says David Perlmutter, M.D., a neurologist and author of the New York Times Bestseller Brain Maker. While that doesn't mean they're not getting any positive results, he says, by avoiding common mistakes they could be reaping more benefit. It's true that many people are drawn to the keto diet because they think it gives them a free pass to load up on cheeseburgers (sans bun, of course). However, eating too much red meat and dairy can have harmful effects on your health, whether or not it helps you meet your keto goals. "One of the most common mistakes I see when following a traditional keto diet is overloading on loads of red meat and dairy — both of which can be extremely inflammatory," says Will Cole, functional medicine expert and author of the book Ketotarian. In a 2017 study in the British Journal of Medicine, eating too much red meat increased the risk of diverticulitis — inflammation of small pouches along the intestinal wall — in men. A 2015 review in Nutrients explains that A1 beta-casein — the primary type in dairy products found in U.S. grocery stores — significantly increases inflammatory markers in rats compared with A1 casein — the ancient casein found in purebred cattle. "If you are going to follow a traditional keto diet, it's important to make sure you are getting high-quality organic meats and grass-fed organic dairy to maximize the good nutrients in these foods and mitigate the negative inflammatory effects," Dr. Cole says. Variety is also key. In addition to red meat and dairy, get protein and healthy fats from wild-caught fish, farm eggs and chicken and nuts and seeds. You need to get upwards of 70 percent of your calories from fat on the keto diet or you won't get into ketosis (the metabolic process in which your body starts burning fat for energy). Dietary fat is also highly satiating, and eating enough of it can help you avoid hunger and carb cravings, says Anthony Gustin, a functional medicine expert. "This is where planning your meals becomes an integral part of the diet," says registered dietitian Abbey Sharp. "Start by filling your protein needs and see how much fat that also contributes to your diet, then focus on filling the rest of your day with fat sources that are low in protein like avocados and added oils," Sharp says. Choosing high-quality fats is crucial. 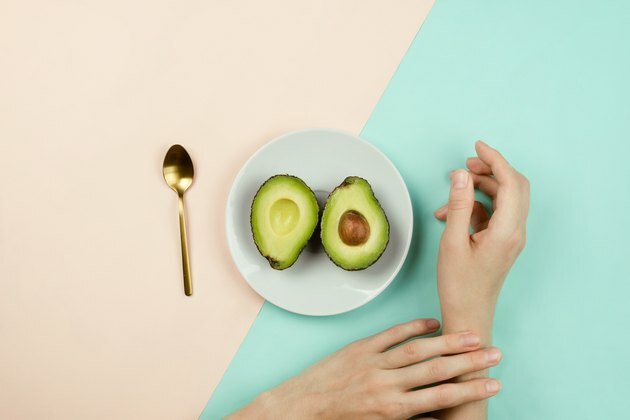 "Plant-based fats such as avocados and coconuts and even omega fats from wild-caught seafood are essential and very healing to the body," says Dr. Cole. "I also recommend never eating industrially produced fats and refined seed oils due to their highly processed and highly inflammatory nature." Dr. Cole says that these products, including sunflower oil, canola oil, vegetable oil, margarine and other butter-like spreads, oxidize easily with light, air or heat. "Without a doubt, the biggest mistake I have observed in people engaging the keto diet stems from their desire to eliminate all carbohydrates," says Dr. Perlmutter. "As such, they eliminate virtually all of the fiber from their diets and this often has significant gastrointestinal consequences." Dr. Perlmutter says that prebiotic fiber, found in foods like garlic, onions, leeks, jicama, Jerusalem artichoke and most vegetables is, in fact, carbohydrate. However, this type of fiber is unique because it's only utilized by gut bacteria, and it doesn't ultimately provide sugar for human physiology. "In those folks who are making the mistake and eliminating all fiber, there are often significant issues with constipation that may in fact lead them to abandon the diet," says Dr. Perlmutter. He suggests looking for sources of prebiotic fiber, like acacia, in health food stores, which can make it easier to get adequate amounts of this important dietary component. Lack of meal-planning is one of the major reasons any diet — including keto — is ultimately unsuccessful. Especially with a diet like keto, in which your macros really need to add up, failing to plan ahead can leave you hanging when hunger strikes. "Without planning meals, specifically snacks, you can end up putting yourself in a situation where you are tempted to eat something because you have no other option," warns Dr. Cole. Planning your meals also ensures you're meeting all your macro quotas while also getting sufficient vitamins and minerals. While it takes a little more work, it's well worth it if it means reaching your goals, says Sharp. "Before you head to the grocery store, write out your meals for the week, along with how much fat, protein and carbs you are getting from each meal," she says. The more you do this the easier it will get. "After a few weeks of doing keto, you'll likely get an immediate sense of the macros in some of your favorite meals to make this process much faster," Sharp says. Following a keto diet — and being successful — takes commitment to closely tracking your food intake. If you don't, you will most likely not achieve your goals. "This is probably the number one reason why people fall out of ketosis or just can't maintain the diet in general," says Sharp. Keeping a journal or using a food tracking app can help you dial in your macros and see what's working and what isn't. "Yes, this may be tedious, but with a keto diet, you must constantly be tracking your macronutrient distributions to ensure you're getting the right amount of fat, protein and carbs," Sharp says. A lot of this can be done when you're planning your meals. "This is a good time to track how much of each food group you are getting from each meal and ensure you are meeting your macro distribution number," says Sharp. Some people can make drastic changes to their diet without significant disturbance to their energy levels, digestion, sleep and overall well-being. Yet, others may experience strong reactions to changes in diet. 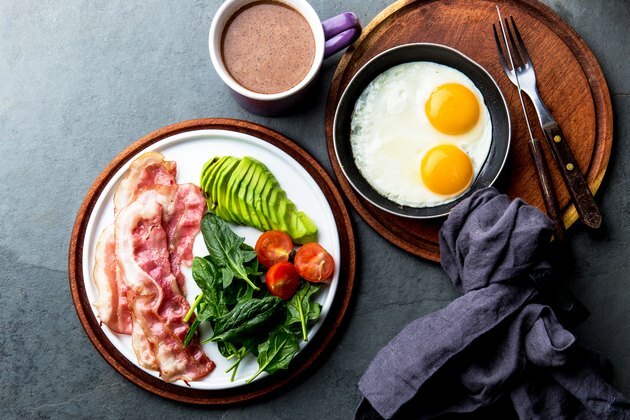 "Generally, people who pursue a keto diet often tolerate this sudden shift in fueling the body with carbohydrates to a state of using fat as a fuel without much difficulty," says Dr. Perlmutter. "Nonetheless, there are certainly a significant amount of people who have to be more judicious about making this shift, as their bodies may just not tolerate such a sudden change." If you're among the latter, the transition period from non-keto to keto can be uncomfortable, causing you to give up or be inconsistent. As such, you should take as much time as your body needs to transition to the new diet, rather than feeling like you have to do it all at once. "Many people, myself included, tend to jump in to things that are health-related very aggressively," says Dr. Perlmutter. But for keto success, he recommends taking at least a week or two — and even more time if needed — to gradually cut down your carb intake and increase your fat intake so your body can get used to the idea. Nutrients: Milk Intolerance, Beta-Casein and Lactose. Dr. Will Cole: Butter: Superfood or Super Unhealthy?